Logan, UT – Express Employment Professionals, the staffing agency in Logan, UT, released results from a new poll of unemployed Americans showing a greater sense of optimism about the future among the unemployed. The national survey of 1,500 jobless Americans age 18 and older between March 14 and April 6, 2017 was conducted online by Harris Poll on behalf of Express and offers a detailed, in-depth look at the background and attitudes of the unemployed. According to the survey, 33 percent agree with the statement, “I’ve completely given up on looking for a job.” While still a startling number, it is a notable improvement compared to previous years, with 43 percent saying they had “given up” in 2016, 40 percent in 2015 and 47 percent in 2014 reporting the same. In addition, more of the unemployed expressed hopefulness than in years past. Ninety-two percent agree with the statement, “I’m hopeful that I will find a job I really want in the next six months,” compared to 87 percent in 2016, 88 percent in 2015, and 91 percent in 2014. Unemployment remains a chronic condition for many, though the average duration of unemployment (23.5 months) is lower than in 2016 (26.3 months) and 2015 (26.8 months) and slightly higher than in 2014 (23.2 months). Thirty percent of unemployed Americans have been out of work for three months or less, 13 percent for four to six months, 13 percent for 7-12 months, 10 percent for 13-24 months and 34 percent for more than two years. When asked why they are unemployed, 22 percent say they quit and 22 percent say they were laid off. This is a new low of people reporting they were laid off, compared to 2016 (23 percent), 2015 (28 percent), and 2014 (36 percent)—an encouraging trend for the economy. When asked who’s “responsible” for their unemployment, 50 percent blame themselves and 26 percent blame the economy. This represents a continued decline in the number blaming the economy, compared to 2016 (34 percent), 2015 (37 percent), and 2014 (45 percent). This is also an increase in those blaming themselves; just 36 percent blamed themselves in 2014. Express Employment Professionals is one of the best temp agencies in Logan, UT, that puts people to work. It generated $3.02 billion in sales and employed a record 500,002 people in 2015. Its long-term goal is to put a million people to work annually. The Logan Express office is located at 1545 N Main St #100, Logan, UT 84341 and serves the Logan, Brigham City, Tremonton, Hyrum, Smithfield, Richmond, Lewiston, UT, and Preston, ID areas. Local businesses and applicants are encouraged to stop by, visit https://www.expresspros.com/LoganUT, or call (435) 213-1740. 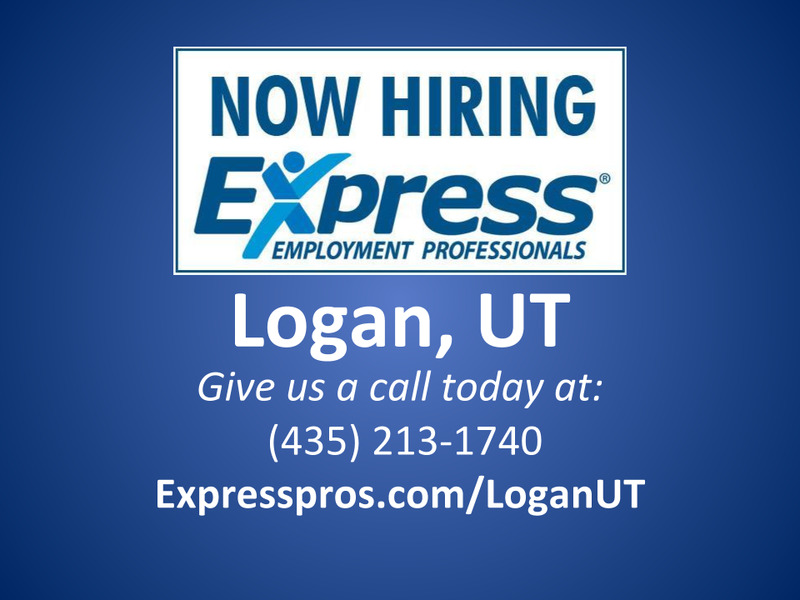 Express Employment Professionals in Logan, UT is one of Cache County’s top Full-Service Staffing Agencies that continuously exceeds expectations by providing workforce services to local companies and helping job seekers find work.